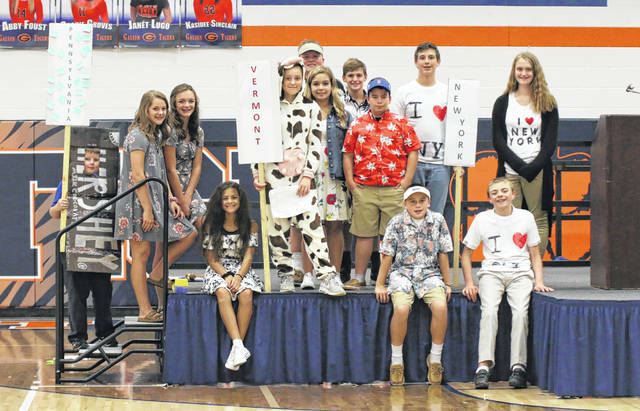 GALION — A popular event from the past returned to Galion Middle School classrooms recently. Former Galion Middle School should remember the annual political convention event with great fondness. It was held every year in the fall with the purpose of electing a a student council president. The political convention process closely mirrored that of the major American political parties during a presidential election. Students were split into two parties, and from there divided into states with a certain number of electoral votes to be cast according to that state. At the end of each convention, two candidates were nominated — one from each party — and the school then voted on a president. It was a well-liked and much-anticipated event for students and staff. Former Galion teacher Marcia Yunker remembers the conventions well. She came to GMS as a history teacher in the mid 1980s, and was heavily involved in the process during her years there. “I think much of the credit for the planning and original idea of the political conventions back then goes to Darrell Lemke and Bob Casey,” Yunker said. “They were very instrumental in getting it off the ground. Unfortunately, state curriculum and testing requirements meant changes over the years for the staff and students at GMS. While there were a couple of attempts to bring the political convention back to the students, it was never able to stay in place. With the implementation of the Lighthouse Team program at Galion Middle School, teachers were looking for some new ideas that would involve and catch the interest of students. Much like the conventions of years gone by, students were divided into separate political parties which were also named by the students: The Wildcats and Your Everyday Educational Team … or The YEET’s. Seven candidates, as well as running mates, stepped up to compete for the nomination between both of the political parties. Each candidate had to come up with a platform, for their campaign which consisted of topics relevant to GMS students, such as vending machine items and getting rid of the student dress code. On the day of the convention, all students had a role in the event. Students led their political party in the National Anthem and the Pledge of Allegiance. Student representatives from each of the 50 states had to deliver small speeches and cast their electoral votes. At the conclusion of each convention, a candidate and running mate from each party was chosen to face off against each other in an upcoming election. Win or lose, candidates will likely serve on a student Lighthouse Leadership committee in some capacity. Teachers at GMS are hopeful that the momentum and learning from this experience will carry on for the rest of the school year and years to come.